When many people need an energy boost at the office, at home or before a workout, they turn to the energy supplement 5 Hour Energy. The 2-ounce energy shot contains a combination of caffeine, B vitamins and amino acids, along with some flavorings and preservatives. Like most energy supplements, however, there is a potential for certain side-effects with 5 Hour Energy. Additionally, the federal Food and Drug Administration has called into question the safety of this supplement. One of the more common side-effects of 5 Hour Energy is what's known as a niacin flush. According to University of Maryland Medical Center, this reaction normally occurs when 50 milligrams or more of niacin are ingested. The original 5 Hour Energy contains 30 milligrams of niacin, and the extra-strength version contains 40 milligrams. A niacin flush is caused by increased blood flow to the skin and can include burning or tingling sensations in the face and chest and red-flushed skin. One way to reduce this symptom is to take an aspirin about 30 minutes before taking niacin. According to Forbes, one original 5 Hour Energy shot contains between 207 and 215 milligrams of caffeine, which is similar to the amount or caffeine in one 12-ounce cup of coffee. Caffeine is a stimulant that can be used to increase mental focus and fight fatigue; however, for some people it can present side-effects as well. These can include rapid heart beat, sleeplessness, anxiousness, nausea, nervousness, irritability, cold sweats, loss of appetite and diarrhea. Additionally, symptoms of caffeine overdose can include headaches, irregular heart beat, fever, dehydration and even seizures in acute overdoses. 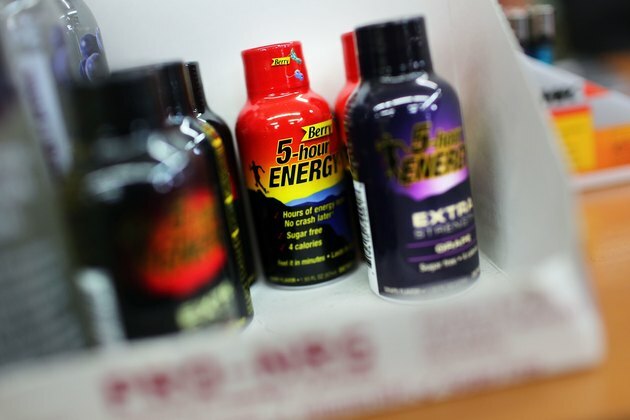 "The New York Times" reports that from 2009 to late 2012, the FDA received some 90 filings of serious injury and 13 reports of death that cited the possible involvement of 5 Hour Energy. The filing of an incident report with the FDA does not, however, mean that a product was responsible for a death or injury. On the other hand, these reports do speak to the unknown nature of the possible effects of 5 Hour Energy. Dr. Brent Bauer, Mayo Clinic director of Complementary and Integrative Medicine, said, "These energy shots have over a dozen ingredients all together, and consumers are ingesting them at very high doses, but there is no research of how the ingredients react all together." 5 Hour Energy comes in three different formulas: original, extra strength and decaffeinated. If you're concerned with the potential side-effects of this energy supplement, consider the decaffeinated version, which also contains no niacin. The manufacturer of this supplement recommends only consuming half a bottle for moderate energy and not does not recommend exceeding two bottles daily. Following these recommendations may help limit any side-effects.